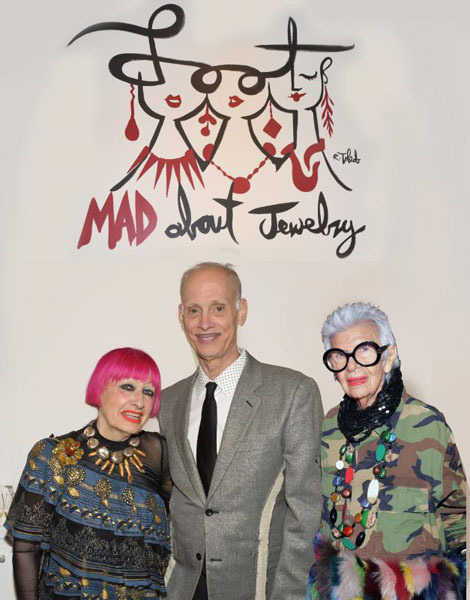 On Monday, April 3rd, world-renowned English fashion designer (and LOOT 2017’s Honorary Chair) Dame Zandra Rhodes was joined by friends John Waters, Daphne Guinness, Anna Sui, Iris Apfel, and Patricia Cleveland at the Museum of Arts and Design’s annual exhibition LOOT: MAD About Jewelry and Opening Benefit sponsored by Paolo Costagli. Each year, the LOOT Award is presented to luminaries in the field of jewelry, from artists to collectors to designers. This annual prize is in keeping with the long-standing commitment of the Museum of Arts and Design to presenting jewelry as an art form. The LOOT 2017 Award was presented to three innovators in the field of jewelry. This year, the Museum honored estate jeweler Camilla Dietz Bergeron, SAME SKY founder Francine LeFrak and jewelry designer and UNLEASHED founder Kara Ross at the benefit dinner at MAD’s ROBERT restaurant. Other notable guests included: Corice Arman, Michele Ateyeh, Dr. Joyce F. Brown, Joanne Brecker, Noreen Buckfire, Kathy Chazen, Liliana Cavendish, Martin Cohen, Patti Dweck, Michael Dweck, Rick Freidberg, Marjorie Reed Gordon, Joan Hornig, Ann Kaplan, Shari Siadat Loeffler, Sharon Handler Loeb, Mary McFadden, Linda Plattus, Paul von Ravenstein, Stephen Ross, Daryl Roth, Dame Jillian Sackler, Jean Shafiroff, Shannon Stratton, Donald Tober, and Barbara Waldman. Guests were greeted at the entrance to ROBERT with appetizers including mushroom croquettes, spanakopita, mini carnitas tacos, smoked salmon with crème fraîche in endive petal, vegetarian sushi, and steamed cocktail shrimp. After guests were seated, LOOT’s Chair Marsy Mittleman welcomed over 200 guests and thanked Dame Zandra Rhodes for being LOOT 2017’s Honorary Chair. Dame Zandra Rhodes returned the thanks with a standing ovation from her table, then introduced and thanked sponsor Paolo Costagli, who presented the award to Camilla Dietz Bergeron. LOOT’s Curator, Bryna Pomp, spoke from the podium “Each year, I seek to present materials that even I have not seen in my decades of work in the field of jewelry. In each edition of LOOT, I strive to show as many different, unique materials as possible in addition to more traditional metals and semiprecious stones. The 2017 presentation includes driftwood, neoprene, marble, sheer plywood, textiles, ceramic, aluminum, beading, and acrylic. A significant trend this year is the use of recycled materials, including china tableware, plastic bottles and shopping bags, and even skateboards.” LOOT’s Honorary Chair Barbara Tober introduced Francine LeFrak with a beautiful introduction. LOOT’s Honorary Chair Michele Cohen presented the award to Kara Ross. The first course of organic baby spinach salad, shaved parmesan cheese & fresh figs; an entrée of French cut organic chicken breast; and ended with a dessert duo of lemon meringue bar, strawberry sorbet, blueberry gelée and chocolate chocolate cake with chocolate ganache. During dinner curator Barbara Paris Gifford announced the dual winners of the LOOT Acquisition Prize and presented the prize to the winners, Ute van der Plaats (Belgium) and Sunyoung Kim (Korea). From April 4-8, 2017, The Museum of Arts and Design will present LOOT: MAD About Jewelry, its annual exhibition and sale featuring designs from more than 50 emerging and acclaimed international jewelry artists. Now in its 17th edition, LOOT has become known as the ultimate pop-up shop for contemporary artist-made jewelry, where collectors and jewelry enthusiasts have the rare opportunity to meet and acquire pieces from some of the most innovative creators in the field. LOOT takes place at the Museum of Arts and Design, 2 Columbus Circle, New York City. Entrance is free with Museum admission. 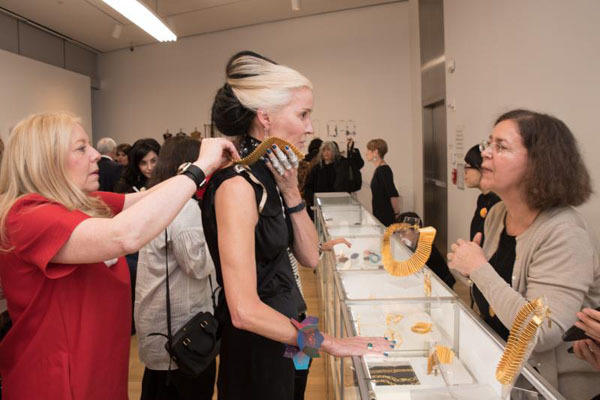 Proceeds from LOOT: MAD About Jewelry benefit the Museum’s exhibitions and education programs. Saturday, April 8: 10am to 6pm. Marsy Mittlemann, LOOT Chair; Michele Cohen, Boar Chair and LOOT Dinner Co-Chair, Dame Zandra Rhodes, LOOT Honorary Chair; Barbara Tober, LOOT Dinner Co-Chair; Bryna Pomp, LOOT Curator; Jonathan Marder, Publicist; Ruben and Isabel Toledo, Invitation Design. LOOT Honorees; Camilla Dietz Bergeron, Francine LeFrak and Kara Ross. Michele Cohen and Barbara Tober, Iris Apfel, Corice Arman, Michele Ateyeh, Noreen Buckfire, Marian C. Burke, Kathy Chazen, Paolo Costagli, Joan Hornig, Ann Kaplan, Judith Leiber, Shari Siadat Loeffler, Liz Swig, Isabel and Ruben Toledo, and Barbara Waldman. The Museum of Arts and Design’s jewelry collection comprises more than 900 pieces of art jewelry from the mid-century to the present. The LOOT Acquisition Prize formalizes the Museum’s goal of enhancing its collection by acquiring jewelry from artists who have made significant contributions to the field and whose work provides historical context for MAD’s mid- to late-twentieth-century pieces, as well as from emerging artists who are an important force in the contemporary art jewelry scene. The inaugural LOOT Acquisition Prize was awarded to designer Alena Willroth in 2016. Past LOOT artists who have had works acquired by the Museum include the well-established art jeweler Iris Nieuwenburg and the emerging jewelry artist Casey Sobel. Paolo Costagli New York is a fine jewelry brand recognized for its sophisticated, modern, and distinctly bold designs. The essence of the Paolo Costagli brand is to be as current as the woman who wears it. At its core is the creativity and technical expertise of its founder, Paolo Costagli. The Italian landscape and architectural details of his upbringing in Florence and Venice are evident in his creations: clean geometries, an acute attention to proportions, and unique color combinations. Regarded as an authority on color gemstones and rare diamonds, Costagli studied to become a Graduate Gemologist at the renowned Gemological Institute of America. He then pushed further, beyond the laboratory and standard course of studies, to experience firsthand the unearthing process. This unusual experience of formal studies combined with an applied knowledge formed a dynamic background, and Costagli has an understanding of the fine jewelry industry that is truly rare. His talents as a designer and expertise as a gemologist have been recognized by the most influential institutions in the industry. His iconic Brillante® collection was awarded the Couture Design Award in the Gold Category the year that the collection debuted at the Couture Show. His gemstone creations are also celebrated for their unique settings and quality of materials, and the Eternitá capsule collection was awarded the InDesign Award in 2016. The Paolo Costagli collection is so avant-garde in its design, executed at the most elevated level of craftsmanship while using the most exquisite materials, that it blurs the line dividing fine jewelry and art. A testament to this is a bracelet from the Brillante® collection, part of the Museum of Arts and Design’s permanent collection. At LOOT this year, Paolo Costagli New York will be debuting the never-before-seen Silver Collection, inspired by the brand’s award-winning Brillante® collection. The Museum of Arts and Design (MAD) champions contemporary makers across creative fields and presents the work of artists, designers, and artisans who apply the highest level of ingenuity and skill. Since the Museum’s founding in 1956 by philanthropist and visionary Aileen Osborn Webb, MAD has celebrated all facets of making and the creative processes by which materials are transformed, from traditional techniques to cutting-edge technologies. Today, the Museum’s curatorial program builds upon a rich history of exhibitions that emphasize a cross-disciplinary approach to art and design, and reveals the workmanship behind the objects and environments that shape our everyday lives. MAD provides an international platform for practitioners who are influencing the direction of cultural production and driving twenty-first-century innovation, and fosters a participatory setting for visitors to have direct encounters with skilled making and compelling works of art and design. The Museum will be celebrating its Diamond Jubilee 60th Anniversary this year.